That's a really attractive style in my opinion. ThymineC wrote: Like I said in this thread, I'd like the differences in ship designs to be based on meaningful choices e.g. what is most appropriate given local resources. Grumblesaur wrote: Wouldn't mind seeing some variation between ships from different manufacturers. Ships for greeblers and greeblephobes alike. I'd like to see aesthetic greeble (or not) as a function of the characteristics of a ship class's creator. Maybe a decadent civilization isn't even trying to make functional ships any more; the real goal is to win points with the aristos by looking more outlandish than the other guy. Maybe a civilization or ship manufacturer is highly pragmatic and their ships are lean-looking, stripped-down, brutally efficient space rapiers. I'd like it even more if this principle applied at a larger scale: attributes of the creators of ships affect the general style of their ships. Maybe a culture on a low-G world, who are accustomed to being able to fly easily, make aerodynamic ships. Denizens of a high-G world just use brute force to move around and don't give a rat's about wind resistance (other than notionally building to survive max Q, perhaps); their ships could be cubical or (if so big that they're entirely space-based) random conglomerations of multi-sized system pods. And ships of cultures with a highly refined artistic/aesthetic sense might be expressed as rounded, elegant shapes. Greeblefication would be an additional step beyond the basic configuration generator. Right, that is exactly what I'm talking about. Its just a jigsaw puzzle of random lines going in random directions. What person ever would design something like that? I'm not saying don't have lines, but the lines would be very faint(probably on the normal map only) because welders aren't incompetent and they'd be painted anyway(for looks, if nothing else), and they should be a grid, because square plates. Or hexagonal plates. Whatever. Just some standard precursor part they hammer and cut into shape. And thats just assuming they use a construction technology like ships today use. If they have fancy 3d printers/replicators that spit out parts, or even a massive ship scale 3d printer, there'd be no seams at all except predesigned access points. Then if you still need visual appeal? Paint jobs. Its a ship in space.. you can paint it whatever color and style you want! You can throw on fancy Amarr like flourishes, deck it out with sharks teeth, add dazzle camo, whatever you want! It could be beneficial to construct ship armor out of standardized puzzle pieces with rather large gaps between them for ease of replacing and repair intead of having the hull made into/from one piece. Same reason with open piping : if your ship relies on shields for defense you might as well leave it open so you can find and repair damages quicker and more easiely than to have to crawl through narrow access shafts that are possibly filled with super cooling fluid or other nasty stuff. Goes double for industrial ships or non-battleships. Heat is actually a major pita as the only way to get rid of heat in space is ..well radiation, conduction or convection don't work because of the vacuum. So whenever i see random shapes covering the surface of a spaceship i assume they are for heat radiation. Damn it Brain .. why? Armor out of standardized puzzle pieces is fine. Rather large gaps are also gaps in the protection. If there are gaps at all, make them as narrow as possible without hindering disassembly/replacement. Harbinger of Crazy wrote: Same reason with open piping : if your ship relies on shields for defense you might as well leave it open so you can find and repair damages quicker and more easiely than to have to crawl through narrow access shafts that are possibly filled with super cooling fluid or other nasty stuff. Is propulsion based on missile-like thrusters (as in the videos so far)? -If yes, you want to show them, and the exhaust flames too. Makes for nice graphics effects. -If no, showing unused thrusters is kind of stupid. Actually, if the ship designer will be as detailed as I hope for, this question will be answered because propulsion is something the player chooses and puts into his design. The look of the ship results from the design. The AI has to build by the same rules for consistency . Are radiation coolers necessary, or does your civilisation have devices that convert heat back into useful energy(http://en.wikipedia.org/wiki/Second_law ... econd_kind)? -If no such devices exist, you need radiation coolers. The more power your engines have, the bigger coolers you need. The more power you use, the hotter the coolers get. AFAIK Elite Dangerous is using that as gameplay element. -If such devices exist, radiation coolers are likely to be a liability. There is no reson to carry them. you usually still have to cool the end of the thermopile that is not heated, to get an big as possible temperature gradient, maximising power. also: what happens if your thermopiles get damaged? how do you get/keep your ship cool? heat radiators. The "perpetual motion of the second kind" device is a hypothetical device that just absorbs heat without needing a cooled end. In real life, such devices don't exist and are considered impossible. In science fiction, maybe they are possible after all. If they would exist, they would just absorb heat without needing cooling anywhere. Different from a real thermopile. You could also have several of them for redundancy. Rabiator wrote: The "perpetual motion of the second kind" device is a hypothetical device that just absorbs heat without needing a cooled end. I tend to disagree, because evenif such a system existed, i doubt it would be 100% efficient. Let's postulate a very optimistic 99% conversion rate: with all your lasers and shield generators, you'd still have to radiate (or store) vast amounts of heat. Most likely you will have means to do so very efficiantly, as huge radiators look pretty goofy and make realy nice targets. 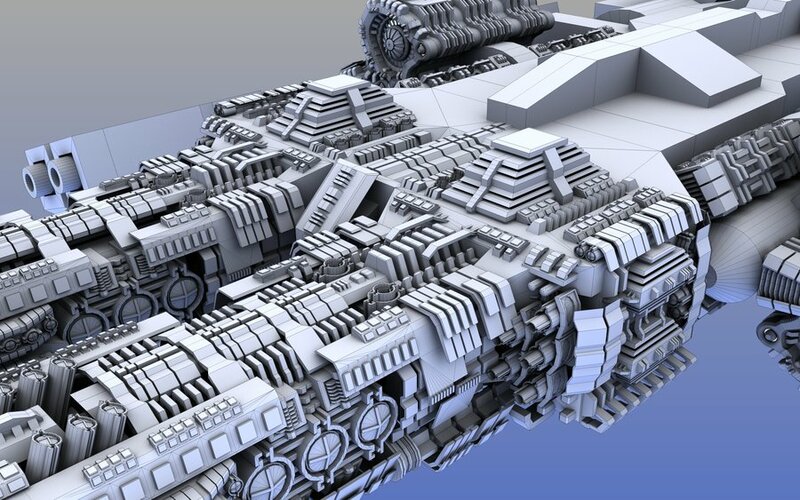 use a layer of procedural greebles to differentiate factions a bit. and break up all the boxes a bit. Holly Molly of Lolly Jolly! 36 months!! New record? Lum wrote: Holly Molly of Lolly Jolly! 36 months!! New record? We just set a new record over here! ThymineC wrote: I'm 100% for greeble. It makes ships look interesting. Rule of cool. Your picture is the rule of hideous, not rule of cool. There is nothing cool about that thing. That it makes no sense is bad enough, but even worse is its not even attractive. Things built to look like they actually work, by people with at least half a clue about engineering... That is cool. Not some mass of scrap metal someone who just discovered the bevel tool spat out. Old post I know but your opinion doesn't define good taste. The greebler design above looks good. ... A Necro'd Necro. Fun. But as for the image in question. There is such a thing as a noise to information ratio. And in this specific one, the noise is WAY high, we get very little information about the shape here, and this means that it's over greebled Objectively. 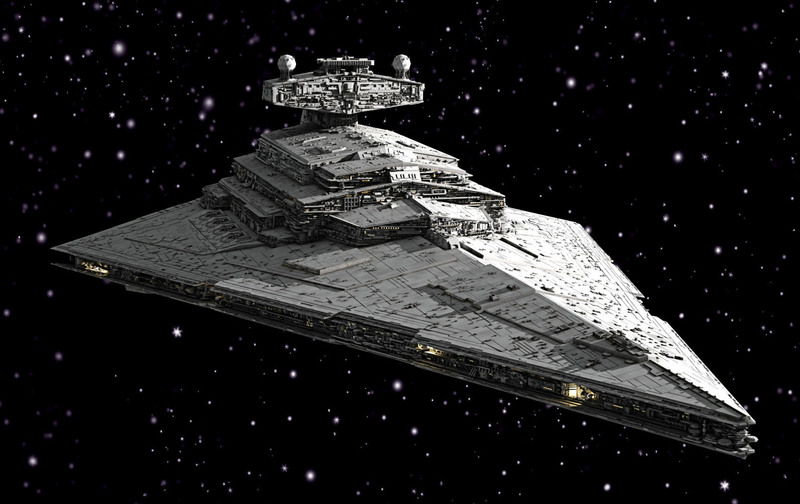 Have a look at a Star Destroyer. This thing has a LOT of greeble, it's basically 100% greebled, all surfaces are interesting. However! The scale of the greeble is tiny, it has a low noise to information ratio. You can clearly see the shape of the object, and identification by shape becomes incredibly easy. This means, Objectively, this object is NOT over greebled. It may even be under greebled. When doing detail, especially detail that doesn't actually add to utility, (like spotting, or role hinting), you need to be careful to not mask said utility.